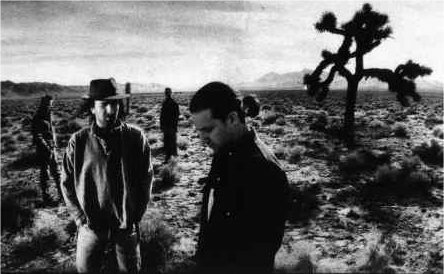 Since the 1987 release of The Joshua Tree album, I, like any other loyal U2 fan, read up on Joshue Trees and dreamed of one day seeing the very tree on the album cover. I learned, for instance, that Joshua trees only grow one place in the entire world: the Mojave Desert. They prefer dry soil and often grow in groves. They have an unpleasant odor and flower occasionally. They rely on the Pronuba Moth for pollination and are members of the lily (Liliaceae) family. I even looked into the name. I mean, why "Joshua" after all? Legend has it that the Mormon pioneers named the tree after the Old Testament Joshua because it looked like the prophet waving them, beckoning them to the promised land. I even learned the history of the Joshua Tree National Park. as a national park in 1994. My next step, of course, was to visit the park and get my picture taken in front of the legendary tree. Well, you may not believe this, but the Joshua tree on the cover of the album is not even located within the Joshua Tree National Park. That's right, you heard me. About two years ago, the tree fell right over, dead as a doornail. But a few of the rangers at the Joshua Tree National Park take pity on the foreign tourists who traveled so far to see this historic tree. They point one out around the bend that just so happens to look something like the one in the picture.